And it’s easy to see that from a small child’s point of view, this store can be magic. If you and your kids are Disney fans then you’ll most probably love this store. 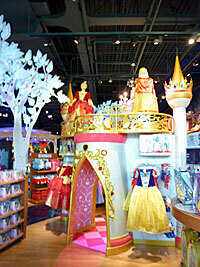 Disney merchandise such as plush toys, clothes, costumes and accessories are prominently displayed throughout, pretty much what anyone would expect in a Disney store. But as you enter and walk on the Pixie Dust Trail, dark blue and glittery with stars, you'll find several surprising features. Probably one of the first things little girly girls will go for is the huge Princess Castle near the front of the store. After going through a small archway, they’ll come upon the Magic Mirror. Costumes line this area so that your little princess can imagine what it would be like to dress up as one. 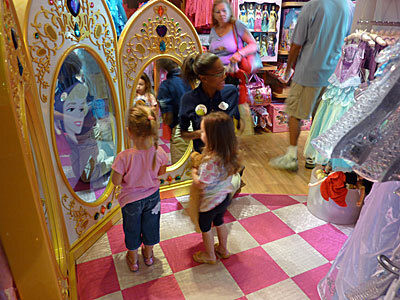 The interactive part is when a “magic wand” is waved in front of the mirror and clips from various Disney’s princess movies appear and surprise the youngsters. The pearly Magical Trees that reach almost to the top of the ceiling have images projected on them that change according to the four seasons. Different movie clips are also sometimes shown here, plus try to see if you can find the hidden Mickeys! 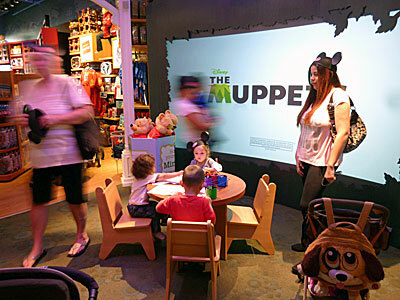 The central Disney Store Theatre has kid-sized chairs and a table where they can draw and play games. The giant viewing screen will show different clips from a video library that shoppers can choose from. It’s also a way for store employees to interact with families. Depending on what’s going on with the crowd, everyday celebrations can be launched from here – from a lost first tooth to un-birthdays, among other things. They can also call on Disney characters to pop in to say hello, appearing on the painted skyline on the store’s walls. Notice the top of the walls for a moment and you’ll see South Florida's subtly portrayed landscape. There’s Peter Pan leading an airboat ride (! ), sabal palms, cattails and the waters of the river of grass. The store, interactive areas and merchandise are geared mostly for kids around ages 2-10 years old, but there are also products that will appeal to adults. The Imagination, Magic and Pixie Dust fragrance collection includes cologne, body lotion and votive candles sure to please teens and moms. And the numerous dolls will appeal to collectors of all ages. The opening of the store’s giant lock by a child chosen from among the guests that lets the store start on the right foot is a daily ritual. 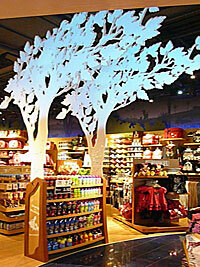 The newly-designed Disney Store is located at Zone C at the Pembroke Lakes Mall. If you’re in the area, be sure to make a stop here!